Power walk with a girlfriend to prevent boredom. 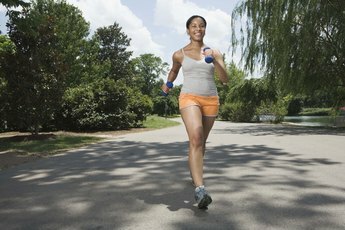 Regardless of your reason for wanting to burn calories -- to lose weight, maintain a healthy weight or simply stay in shape -- power walking is an excellent way to burn calories. 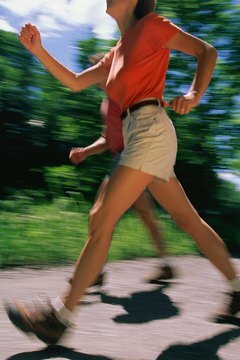 In fact, if you walk at a quick enough pace, you could burn even more calories power walking than you would jogging. Burning enough calories to offset the calories you consume each day is the key to losing weight and creating a slimmer waistline. The good news for power walkers is that you don’t have to walk a long distance to burn extra calories. A study published in a 2004 issue of the “Journal of Strength and Conditioning Research” reports that subjects who walked--at a moderate intensity—for 30 minutes burned the same number of calories as those who walked three bouts of 10-minute intervals at different times throughout the day. This is good news for working women or stay-at-home moms who don’t have much time for workouts and have to squeeze short exercise sessions into an already packed schedule. If you weigh more than you’d like, your power walking pace may be approximately 2 to 3.5 miles per hour; the effort you exert while walking determines your walking intensity. If you’re breathing hard and using your arms to walk briskly, you are power walking. According to Mayo Clinic, women who weigh 200 pounds can burn 255 calories walking for an hour at a pace of 2 miles per hour and can burn about 391 calories walking for an hour at a pace of 3.5 miles per hour; a 240-pound woman will burn 305 calories walking for one hour at a pace of 2 miles per hour and about 469 calories walking for one hour at a pace of 3.5 miles per hour. If you’re at your ideal body weight, you can likely walk faster exerting the same amount of effort as someone who is overweight. According to Harvard Medical School, a 125-pound woman can burn about 270 calories an hour walking at a pace of 4 miles per hour or burn 300 calories walking for an hour at 4.5 miles per hour; a 155-pound woman will burn about 334 calories walking for an hour at a pace of 4 miles per hour, or burn about 372 calories walking for an hour at 4.5 miles per hour. If you want to burn even more calories during your workout, walk uphill, bump up the incline on your treadmill or hold onto light dumbbell weights. This will also help increase your muscle definition. If you eat more calories than you burn throughout the day, all your hard work power walking won’t pay off. According to the Dietary Guidelines for Americans 2010, moderately active women need about 1,800 to 2,200 calories per day and active women require 2,000 to 2,400 calories each day for healthy weight maintenance. The Dietary Guidelines 2010 classify you as active if you walk more than 3 miles per day, and moderately active if you walk 1.5 to 3 miles per day at a pace of 3 to 4 miles per hour. Energy needs for overweight or active women interested in losing weight are 1,200 to 1,600 calories per day, according to the U.S. Department of Health and Human Services.